Editorial side note: Even thought this post is about a particular conference, it is also an excellent post for people attempting to try Virtually Connecting for the first time – it shows the dynamic and serendipitous process, and has some great tips for virtual and onsite buddies alike. Connecting at the International Society for Scholarship for Teaching and Learning conference (#ISSOTL15) in Melbourne, Australia included quite a few ‘firsts’. Anyone from #incluDEau chat going to @issotl2015 in Melb? 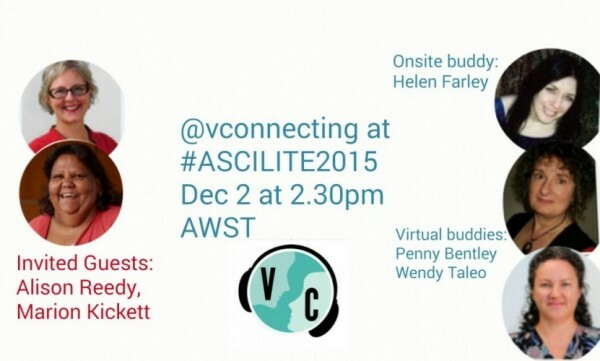 @wentale @issotl2015, Sure Wendy. I don't know how @VConnecting works – familiar with Skype, Google hangout. Email penny@icannetwork.com.au. Here is Simon Lancaster’s Storify of the conference which includes his experience in participating in the Virtually Connecting session. It was the first Virtually Connecting event for an Australian based conference. It required the onsite buddy to gate crash and a first for the virtual buddy to host the session as well. With four guests onsite to join the conversation at least three of them stated it was the first time they had done anything like this. Below are the participants and some of the views of the conversation. Virtually, we had Wendy Taleo (@wentale) as virtual buddy, and the follow participants: Helen DeWaard (@hj_dewaard), Rosie Nash (@pharmEducator). Having the chat the day before the hangout also helped me immensely as I was more comfortable with you. I agree that we made a good team and hope we have the opportunity to do that again at some stage. Virtually Connecting at conferences means an onsite buddy needs to be flexible and willing to deal with a fair bit of last minute planning as everything falls into place. For Penny Bentley that required meeting with attendees she’d never met before, at a conference she wasn’t registered to attend, in a room she wasn’t able to set up prior to the hangout. One thing I did learn was the importance of having an onsite buddy. When time is tight for conference attendees and everything depends on having a reliable internet connection, it pays to have a VC person onsite to support others. It also helps to seek advice from someone who has experienced the role before. Maha’s words of wisdom worked for me “enjoy, it’s just like sitting around and talking about the conference with your friends”. She was right and that’s exactly how it felt. It was exciting and everyone was keen to chat from their diverse range of perspectives. 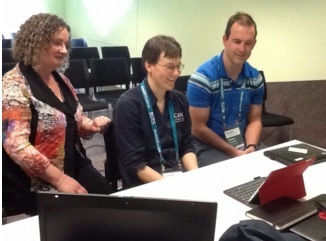 As our virtual buddy Wendy observed “between a chemistry professor, pharmacist and other guests … it was certainly a challenge!” To make the most of a short Virtually Connecting session, the onsite buddy is crucial for managing the conversation flow. Even if it feels like you’re butting in on the conversation, it’s our role to enable everyone to have a chance to speak and answer questions. It would be excellent if a tech savvy person out there could create a brief one minute ‘best of’ VC promotional video to capture the essence of what we do. That would have come in handy when trying to recruit conference attendees who wanted to know more about this initiative. A VC identifier, perhaps a lanyard or badge, would be ideal for those of us who need to gate crash events in the future! Perhaps one of the trickiest parts of this type of connecting is making sure that everyone has the correct link! To share the Google Hangout join link we had the option of a Slack channel, Twitter Direct messaging (DM), Facebook personal message (PM) and email. For this Hangout we also had the backup measure of mobile phone numbers. Maha Bali pointed out later that she prefers Facebook PM due to the notifications that are setup but acknowledged that not everyone is on Facebook. As the Internet provides many options so people have their preferred method of receiving this type of information depending on device and mode of operating. Google Plus Hangouts also have an Event manager that allows management of invitations but this does not provide the link to join a Hangout. This seems to be a weakness of Google Hangouts. The best way is to agree on the preferred method and then have a few backup methods as well. Location, location, location….it’s a good cry for Virtual Connection. The onsite buddy would ideally check out the ‘quiet’ place beforehand to make sure that whatever device is being used can access the Internet and disturbances will be minimised. Always have another option for internet connection. Luckily Penny Bentley was able to use an iPhone as a hotspot to access the Internet on an iPad. Crazy that a University in Melbourne, Australia still has problems with providing a reliable internet connection. There was also a question about permission required to broadcast from within the conference space. Another task for the onsite buddy is to check this out before the Hangout. Virtually Connecting relies on technology to join people in a global conversation. Maybe it will get easier, more mobile and with more clarity or maybe the complexities of connecting across the distances will always be a moving and worthwhile feast.